The Vikings have more than $32 million of cap space wrapped up in their starting defensive line this year. On Sunday, that looked like a prudent investment. For the better part of two years, the Vikings have built one of the NFL’s best defensive lines while working with what amounted to overachieving role players at one of the most important positions in Mike Zimmer’s defense. The three-technique tackle spot, as Geno Atkins showed in Cincinnati, is one where a skilled player against both the run and the pass can be a force in Zimmer’s defense. He was one of two players in Cincinnati to post a double-digit sack season while Zimmer was the defensive coordinator, preaching a system that taught linemen to play blocks first, choking off running lanes and collapsing space on the way to the quarterback. Atkins was a first-team All-Pro in 2012, and repeated the honor in 2015 while playing for Paul Guenther, Zimmer’s successor as the Bengals’ defensive coordinator. The Vikings had used the first of their three first-round picks on Sharrif Floyd the year before they hired Zimmer, and had high hopes that Floyd could become both a stout run defender and disruptive pass rusher in the middle of their line. When Floyd was healthy, he showed the potential to be that kind of player, but knee issues waylaid his career, and after a 2016 knee operation caused nerve damage in his right leg, Floyd spent the 2017 season on the non-football injury list, coming to grips with the end of his time in Minnesota while his camp filed a grievance over the Vikings’ decision to pay him only $2 million, rather than his full $6.757 million salary, for the 2017 season (that grievance, according to NFLPA records, has yet to be resolved). Without Floyd, the Vikings made do with overachieving role players like Tom Johnson and Shamar Stephen for the better part of two seasons. This offseason, though, the Vikings signed former Pro Bowler Sheldon Richardson to a one-year contract, adding a dynamic three-technique tackle to the middle of a line that already included Everson Griffen, Linval Joseph and Danielle Hunter. The Vikings have more than $32 million of cap space wrapped up in the group this year. On Sunday, that looked like a prudent investment. The group combined for two sacks, eight quarterback hits and two tackles for loss in Sunday’s 24-16 win over the 49ers, setting the tone in a game where Jimmy Garoppolo completed only 15 of 33 passes and threw three interceptions. Richardson was particularly disruptive, making six tackles, splitting a sack with Everson Griffen, drawing a holding penalty and hitting Garoppolo on his last interception. “The more that we can do that, the more we can be productive in the middle there with our pass rush, the more it will help our ends,” Zimmer said. After returning from a left knee injury and leading the Packers back from a 20-0 deficit to a 24-23 win on Sunday night, quarterback Aaron Rodgers said he’s playing against the Vikings on Sunday. This week will tell if his early pronouncement holds up, but if he plays, the Packers will have their hands full as they try to protect him. They had enough trouble with Khalil Mack on Sunday night, and against the Vikings, they’ll have to deal with a pass rush that looked even more potent thanks to Richardson’s addition on Sunday. –The Vikings used bunch formations and stack releases to great effect on Sunday, as new offensive coordinator John DeFilippo deployed some clever ways to scheme receivers open. On Kirk Cousins’ 34-yard completion to Adam Thielen in the third quarter, Stacy Coley’s deep route cleared the outside corner, leaving room for Cousins to find Thielen near the left sideline. Laquon Treadwell’s 16-yard catch-and-run late in the second quarter came after the Vikings sent Dalvin Cook out into the flat to occupy Richard Sherman in zone coverage, creating a free release for Treadwell on an in-breaking route. –We talked before the game yesterday about how the 49ers would use their ’21’ personnel (two running backs, one tight end, two wide receivers) to stress linebackers in coverage, and perhaps one of the pivotal moments of the game — George Kittle’s drop before Mike Hughes’ interception return touchdown — saw the 49ers create the potential for a big play from one of their favorite looks. With 10:56 left in the third quarter, Garoppolo carried out a play action fake to Alfred Morris on what looked like a lead play behind Kyle Juszczyk, and all three Vikings linebackers reacted to both the play fake and the ensuing pass routes from Morris and Juszczyk. 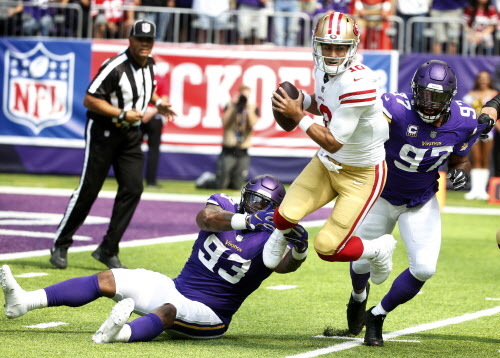 Kittle, meanwhile, slipped through the second level of the Vikings’ defense after looking to chip Danielle Hunter at the snap, and got behind both Anthony Barr and Eric Kendricks at midfield. Had Kittle been able to hang onto the ball, he would have had at least 35 or 40 yards. Instead, the drop put the 49ers in 3rd-and-8 from their own 20, and the Vikings’ blitz triggered Garoppolo’s interception to Hughes. Still, it was a sharp play design from coach Kyle Shanahan, and on the 49ers’ next offensive play, Garoppolo hit Juszczyk for 56 yards on a wheel route while Morris’ route occupied Ben Gedeon for a split-second. The following series saw Garoppolo find Kittle for 36 yards, after play fakes to Matt Breida and Pierre Garcon froze the Vikings’ linebackers. It’s unlikely the Vikings will spend as much time in their base defense against the Packers as they did on Sunday against the 49ers, who employ a fullback as much as any team in the league, but Sunday’s game film could entice future opponents to attack the second level of their defense off play fakes in a similar fashion. The Vikings had been working with their three-safety nickel package throughout the preseason, and Kearse — whom Zimmer said has improved markedly in terms of understanding the Vikings’ defense — is playing there ahead of George Iloka. But with Mackensie Alexander inactive because of an ankle injury and Mike Hughes shifting out to left cornerback after Trae Waynes’ knee injury, the Vikings were hard-pressed for depth in the secondary. That’s certainly one of the big injury subplots worth watching this week as they head into Green Bay.